Mandaue, officially the City of Mandaue (Cebuano: Dakbayan sa Mandaue; Tagalog: Lungsod ng Mandaue) or simply known as Mandaue City, is a 1st class highly urbanized city in the island province of Cebu in the region of Central Visayas, Philippines. According to the 2015 census, it has a population of 362,654 people. Mandaue City is located on the central-eastern coastal region of Cebu. 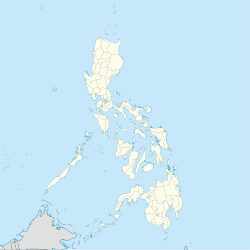 Its southwest coast borders Mactan Island where Lapu-Lapu City is located and is connected to the island via two bridges: the Mactan-Mandaue Bridge and Marcelo Fernan Bridge. Mandaue City is bounded on the north by the town of Consolacion, to the east by the Camotes Sea, and to the west and south by Cebu City. It is one of three highly urbanized cities on Cebu island and forms a part of the Cebu Metropolitan area  and is part of the Sixth District of Cebu joined with the municipalities of Consolacion and Cordova. Although qualified for a lone district since 1991, this was neglected by lawmakers. Despite being an independent highly urbanized city it is legislatively administered with the supervision of the provincial government. A community was established in Mandaue by a flourishing group of Austronesian people. The Venetian chronicler Antonio Pigafetta wrote of a settlement called Mandani which existed in the area with a chieftain named Apo Noan then a few decades later another ruler named Lambuzzan. Mandaue natives were forced into a town as decreed by the Spanish authorities. This may have started off as a mission village (which included present day Consolacion, Liloan and Poro) serving as a bulwark for the church in the northern Cebu and was managed by the Jesuit in 1638 then a century later by the Recollects. The Philippine revolution in 1898 gave the town a new form of administration in accordance with the organic decree of the Central Revolutionary Government. The short-lived revolution was overthrown by the American Troops and a battle nearly destroyed the town in 1901, killing Presidente Benito Ceniza. Mandaue was a semi-autonomous functioning town. Semi-autonomous as it was still under the jurisdiction of Cebu. Despite having been developed and organized by the Spaniards through-out the ages and its population increasing as the years gone by, the Spaniards did not make an initiative to elevate the town into an independent municipality. It was only after the death of Presidente Ceniza and the establishment of American Rule in Mandaue that the dream of becoming an independent municipality came true. In 1901, Mandaue became an independent municipality. Mandaue became independent from being an American Commonwealth and a Japanese garrison on July 4, 1946 along with the entire nation. Mandaue became a chartered city on August 30, 1969 and decades later it was recognized as an HUC (Highly Urbanized City) on February 15, 1991. The city has a total area of 34.87 km2 (13.46 sq mi). According to the 2015 census, the population density is 10,000/km2 (26,000/sq mi). The city is the 6th smallest government unit in terms of land area; among the Metro Cebu local government units the city is the second smallest next to the municipality of Cordova in the island of Mactan. The city's land area is only 4.5% of the total land area of Metro Cebu and less than 1% of the total land of the province of Cebu. The North Reclamation Project, now known as the North Special Administrative Zone, currently has about 180 ha (440 acres) reclaimed land. Of the 180 hectares, about 36 ha (89 acres) belong to the city. It is one of the two (the other one being the municipality of Consolacion) local government units located within the mainland Metro Cebu where the elevation of land is less than 100 m (330 ft). Many of the areas of the city are extremely flat. About 77.37% is within the 0-8% slope category. Barangays belonging to this region are Centro, Looc, South Special Administrative Zone, Cambaro, Opao, Umapad, Paknaan, Alang-alang, Tipolo, Ibabao, Guizo, Subangdaku, Mantuyong, Maguikay and Tabok. The greater portion of the city, comprising about 70%, is dominated by the Mandaue Clay Loam soil series. This is found in the 0-2% and 2-5% slope ranges. Faraon clay loam characterizes the rest of the land with slope range from 5-8% and up to 25-40%. Data showed that the oldest written accounts of Mandaue came from a population of 160 in 1637 to 1638. Mandaue had 10,309 souls according to the Buzeta & Bravo (1850). During the first year of its township in 1899, Mandaue had 42 barrios with a population of 21,086. When Mandaue was a second class municipality in 1964 its population was 33,811. According to the 2015 census, it has a population of 362,654, which is an increase of 102,926. Mandaue has a significantly large population at or below the poverty line. About 40 percent of Cebu’s export companies are found in Mandaue. The city is dubbed as the industrial hub of Region VII and hosts about 10,000 industrial and commercial businesses, making it a “little rich city” in the country. It is home to some of the world’s biggest companies such as San Miguel Corp., Coca-Cola Bottling Corp. and Shemberg, the number one exporter of carrageenan. Mandaue City also accounts for 75 percent of the country’s total exports in the furniture sector, making the city the furniture capital of the country. Mandaue Fiesta: Celebrated on May 8 in honor of the patron St. Joseph. Activities that are typically held during this feast are the inter-barangay sports competition, Queen Prince and Princess coronation, rodeos, street festival, bailes, fairs, and many more. Panagtagbo or Traslacion (Gathering of the Holy Family): Coincidentally the patrons of Metro Cebu are Santo Niño of Cebu City, Birhen sa Guadelupe of Lapu-Lapu City, and Saint Joseph of Mandaue City. This is celebrated every 3rd week of January when the three images meet in the National Shrine of Saint Joseph often called the Traslacion. This happens on a Friday and on the early morning of the following day a fluvial procession is held. There are singing and dancing competitions, and street dancing that happens during the Bibingkahan in honor of Sto. Niño. Kabayo Festival: The Kabayo (Horse) festival also known as Governor's Cup is a horse racing and different equestrian sports with the western way of riding event held annually in the second week of February. Pasigarbo sa Sugbo: It is an event that is held annually in Mandaue City, Cebu International Convention Center every August 13 which shows Cebu's culture and different festivals, it is a fiesta of colorful costumes and elaborate props as dancers from 42 towns and cities from all over Cebu compete which ends with a fireworks display. Mandaue has many restaurants which cater to gourmets and international cuisines like Italian, Japanese, Indian, Mediterranean, Lebanese, Arabic, Russian, Korean, Mexican, and Western cuisines. A variety of restaurants also serves meals of local cuisine. Many famous Cebuano meals like the lechon or inasal, eaten with achara or pickled vegetables. The sugba or barbecue of either isda (fish), baboy (pork), manok (chicken) or baka (beef) is found all over Mandaue eaten with puso, a diamond-shaped hanged rice covered in coco leaves. Kinilaw is raw meat usually pork or fish drenched in vinegar and salt. The buwad or dried seafood, either fish or squid, can be pungent with a crunchy and chewy texture. There are some exotic meals that can be found like dinuguan or pig's blood which is eaten like a soup. Barbecued chicken feet are liked by many locals. Original cuisine in Mandaue includes bibingka which is steamed rice cakes mixed with coconut and sometimes egg. Binangos paired with rice is made of ground up corn with Bolinao fish. This dish is found only in Mandaue; other delicacies includes the tagaktak, the seasonal buriring fish (stewed with iba) and the famous masareal. Road density is 5.31 km/km2 (8.55 mi/sq mi) of land. In terms of population, road density is 0.04 km (0.025 mi) per one thousand inhabitants. Land transportation is being served by PUJ, utility vehicles, mini-buses, multi-cabs, tricycles, trisikads and for cargoes, trailers and vans. Sea transport of Mandaue is highly dependent on Port of Cebu and Cebu International Port, because of the city's proximity to these facilities. Lapu-Lapu Mandaue campus of the University of Cebu. Schools in Mandaue City follow a system of 6 years for primary education and 6 years for secondary education. There are technical schools like TESDA in Banilad and Looc and other private institutions that provide certificate degrees. Associate degree, Baccalaureate Degrees, Master's and Doctoral programs are available in specific Universities. Mandaue has institutionalized learning with the Cabahug Medal which was started on 1923 by Sotero Cabahug as a medal of academic excellence annually. The Mandaue Fraternal Society was also created in the early part of the 19th century to provide a community for the professionals during the time when Mandaue was still a sleepy town. Cebu's part-time Japanese school, the Cebu Japanese School (CJS; セブ補習授業校 Sebu Hoshū Jugyō Kō), is located on the fifth floor of the Clotilde Commercial Center in Barangay Casuntingan, Mandaue City. ^ "The brilliance of Mandaue City". Mandaue City. 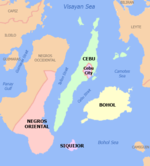 cebu-philippines.net. ^ To America and Around the World: The Logs of Christopher Columbus and of ... Antonio Pigafetta, Raleigh Ashlin Skelton. Branden Publishing Co. 2001. ISBN 9780828320634. ^ Magellan's voyage: a narrative of the first circumnavigation. Antonio Pigafetta/ Adolph Caso. Yale University. 1994. ISBN 9780486280998. ^ "History". Mandaue City. Mandaue city government. ^ "Land Use". Mandaue City. Mandaue city government. ^ "MANDAUE CITY: POPULATION TO REACH HALF A MILLION IN 2011". Census. Philippine Census. ^ "Population". Mandaue City. Mandaue city government. ^ Cebu Daily News 2015. ^ "Other Landmarks". Tourism. The City of Mandaue. Retrieved 2008-04-22. ^ "Mandaue Opens First Agri Eco Park". CDN. Cebu Daily News. Retrieved 2018-02-22. ^ "Sugba Tuwa Kilaw". Travelocity.com. Travelocity.com. ^ Home page. Cebu Japanese School. Retrieved on April 2, 2015. "5th /F Clotilde Commercial CenterM.L. Quezon St., Casuntingan, Mandaue City 6014 Philippines"
^ "Mandaue City officials fly to Romania for sister-city deal". The Manila Bulletin Newspaper Online. Manila Bulletin Publishing Corporation. Retrieved 2012-06-22. ^ "Mandaue, Mosul sign sister-city agreement". Official Website of Mandaue City. The City of Mandaue. Retrieved 2012-06-21. Buzeta, Fr Manuel & Bravo, Fr Felipe, eds. (1850). Diccionario, geografico, estadistico, historico de las Islas Filipinas (2 vols) (in Spanish). Madrid. Cebu Daily News, Norman V. Mendoza (23 January 2015). "Rainbow lane in Mandaue". Archived from the original on 15 April 2015. Wikimedia Commons has media related to Mandaue. Wikivoyage has a travel guide for Mandaue. This page was last edited on 12 April 2019, at 07:16 (UTC).